At Arnold Clark we aim to develop our employees so that future expansion and growth may be sourced from within the organisation through people who are committed to our culture and company ethos. We are currently offering the right candidates an ideal opportunity to join and grow with us, through a variety of positions. We offer vacancies throughout all sectors, from Sales and Customer Service to Bodyshop and Valeting at a variety of locations throughout the UK. For an insight into some of the roles at Arnold Clark, view the case studies below to see how some of our employees have progressed through the company. Many customers have remarked on the level of customer service that they have received. 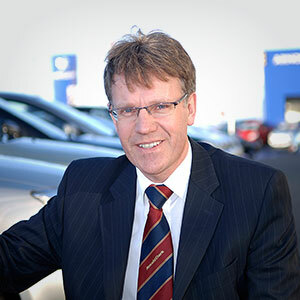 Angus McLelland is the General Manager of Arnold Clark's Toyota branch in Ayr. 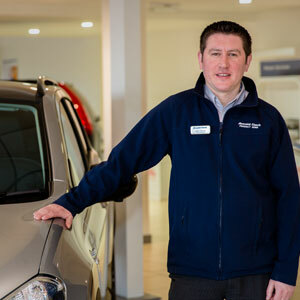 Being a local man of Ayr he said, "I have been in the motor trade for many years and it is a pleasure to be able to work within the community of Ayr, and the surrounding area." Originally from Minnigaff and educated at the Douglas Ewart High School, Angus started with the Arnold Clark organisation in 1988 as a trainee Sales Executive. His time with Arnold Clark has seen him move through various franchises as he worked his way up the corporate ladder. 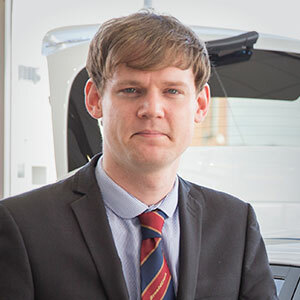 He said, "I've sold a wide range of vehicles with Arnold Clark including Peugeot, Nissan, MG Rover and now Toyota but have always been able to assure customers of a quality service with a company they can trust. Having mainly worked in Glasgow, I'm looking forward to dealing with local people." The branch staff are proud of the relationship they have with the local community and have undergone training to the highest standards to complete a range of both Toyota and Arnold Clark courses, enabling them to sell customers the right vehicle to suit each person and the correct FSA products. I get a lot of satisfaction when a customer purchases a car as I know that I've helped make it happen. Before John joined Arnold Clark, he worked as an Area Representative. In this role his duties were; to build and maintain flooring displays, train staff on selling techniques, hold demonstration sessions for customers, check and order stock, plus general housekeeping. After starting his search for a new job, he realised that he wanted a career not just a job. He looked into Arnold Clark and the more he read, the more he liked, and the fact that a lot of the management positions are recruited for from within the company really appealed to him. John was employed by Arnold Clark in October 2012 as a Product Genius. Speaking about his role, he said "My role as a Product Genius is pretty busy. When I arrive at work everyday, my first task is to speak individually to each of the Product Consultants and find out if they have any appointments with customers and if they require me to do any test drives or handovers. If so I mark them up in my diary for the day ahead. If I have a test drive arranged I make sure beforehand that we have the correct car in stock and it is fuelled - ready for the test drive." Other duties that John undertakes includes meeting and greeting customers and keeping his knowledge of the Nissan range cutting edge. This is achieved by reading up on all of the cars in the Nissan range and answering questions that customers may have regarding the cars. In terms of keeping himself motivated, he said "I have a strong sense of self-motivation combined with a passion for dealing with the public. I like the idea of passing on useful information to potential customers and I get a lot of satisfaction when a customer purchases a car as I know that I've helped make it happen. We also have a great group of people at Royston Road which is an added bonus!" 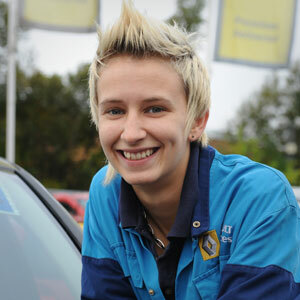 Women should not be put off by men in the motor industry. They usually do a better job! Heather started as an apprentice at Arnold Clark and is now a fully qualified vehicle technician with ambition! As well as keeping the workplace tidy, Heather completes diagnostic work on all makes and models at Pollokshaws Renault and although both mentally and physically demanding, it is very rewarding. "I would definitely recommend a career as a mechanic as it is full of opportunities to improve your knowledge and skills of the motor trade. I won the apprentice of the year out of a class of boys, women should not be put off by men in the motor industry" and with a smirk adds, "They usually do a better job!" Being part of a growing business assures me that there are opportunities for those who want to progress and achieve. Before joining Arnold Clark, Chris studied Maths at Newcastle University and worked part-time in a coffee shop. When he left university, Chris looked into various graduate programmes with the ultimate aim of becoming a qualified accountant; he therefore applied to companies where the job offer included sponsorship for an accountancy qualification. After speaking to friends and colleagues who had been in a similar situation, he decided to go straight into industry rather than down an accountancy firm route. After applying for a position on Arnold Clark's Accounts Academy programme, which was posted on the university's website, he was offered the role and was keen to get started. Chris has now been with the company for 5 years. Speaking about his day-to-day job he says, "My days are rarely the same, so it's difficult to outline what a 'general day' would entail. My role requires me to oversee the accountancy and sales admin functions at 20 Arnold Clark branches. I spend time analysing procedures and improving them, recruiting and developing staff, analysing branch performance and advising management of routes that will result in better performance. I also get the opportunity to travel around different branches in a bid to maintain good contact with all staff under my remit. Maintaining a support team for my branches and integrating acquisitions into the group is also integral to success in my role." Chris' motivation to succeed in his field has been further stimulated by the opportunities that can arise within Arnold Clark and he feels that his efforts to improve and learn the business and industry have been rewarded. He was forthright with his ambition and it motivated him greatly to know that his own assessment of what he could do for the company was echoed by his superiors by the trust they put in him. Chris comments about his time with Arnold Clark, "I have thoroughly enjoyed my time with Arnold Clark so far and I would recommend working for the company. Being part of a growing business assures me that there are opportunities for those who want to progress and achieve."